Superman had it right: if you want to keep something safe, build a mountain fortress above the Arctic Circle. That's the thinking  more or less  behind the Svalbard Global Seed Vault. Almost every nation keeps collections of native seeds so local crops can be replanted in case of an agricultural disaster. 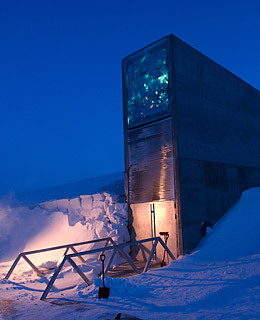 The Global Seed Vault, opened this year on the far-northern Norwegian island of Spitsbergen, is a backup for the backups. It's badly needed  as many as half the seed banks in developing countries are at risk from natural disasters or general instability. The vault can hold up to 4.5 million samples, which will be kept dry at about 0°F (-18°C). Even if the facility loses power, the Arctic climate should keep the seeds viable for thousands of years. Let's just hope we still like corn then.